Addition to the beautiful view of the Gulf of Thailand, you can see at the fishing village in Cha-Am many exotic birds that prey on fish waste. The fishing port of Cha-Am has been expanded in the form of the letter U. On the right and left site are about 4 meter high stone dams, which provide that there are no waves in the harbor during stormy sea and the ships are safe. The complete expansion of the dams in the harbor are now about a mile long and they were completed in the last two years. A fishing boat drives in the calm harbor from the Cha-Am fishing port. The Gulf of Thailand and therefore also Cha-Am are exposed to the tides ebb and flood. This is strongly felt, because at low tide the fishing boats are set in the mud. Only when the tide starts again, they can drive back to the sea. 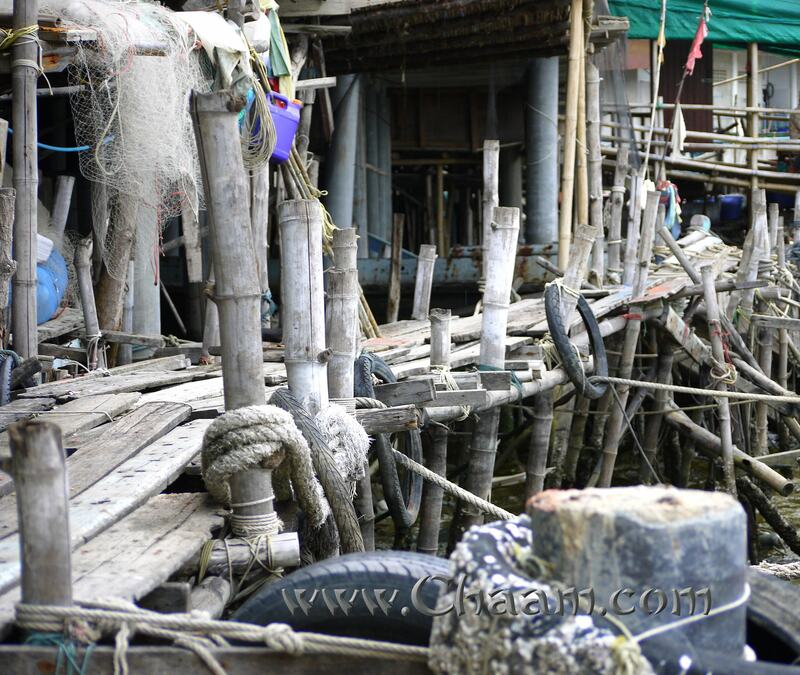 It looks adventurous for us but it is for the Thai fishing man everyday life: The rotting wooden walkway, where the ships are attached. 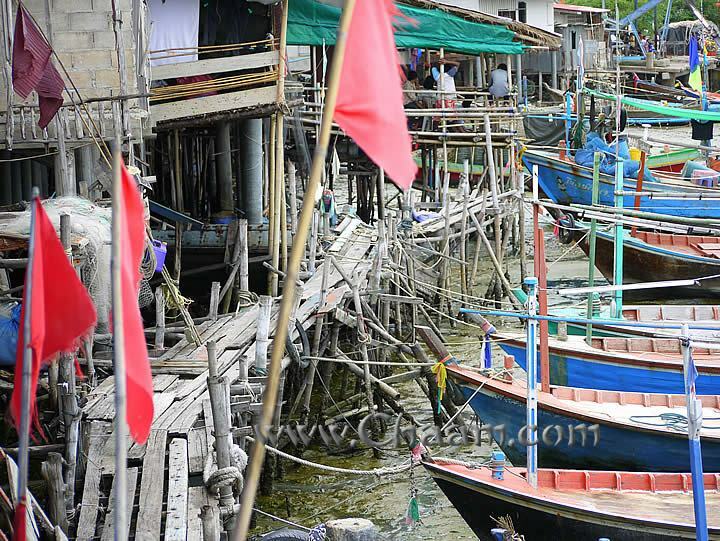 The wooden walkway passes by some fishermen's huts, inhabited by fishermen and their families. 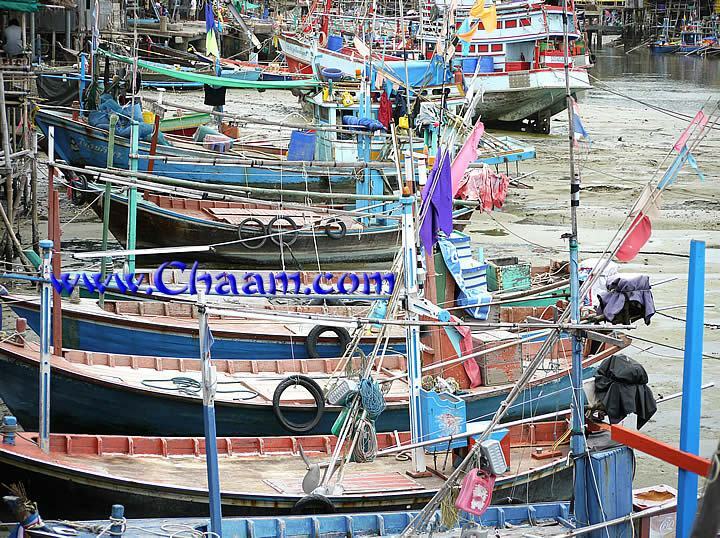 Among them are many people from Burma who gets easily a visa and working permission. They work for little money this hard job. 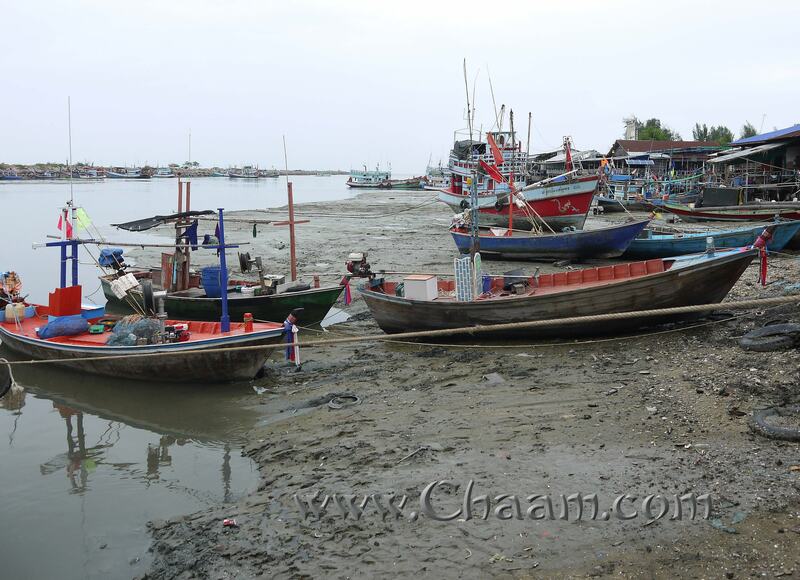 The harbor of Cha-Am is full of mud during the low tide. Only a narrow shipping channel for the ships is still passable. 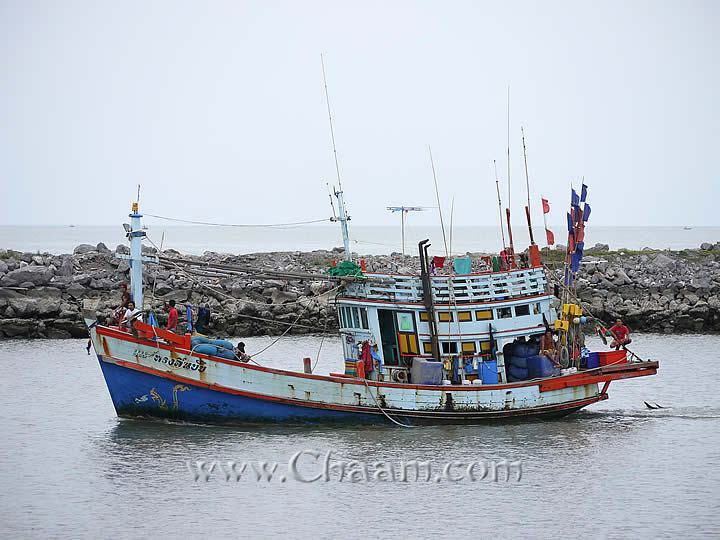 The foreign guest workers, who are coming mainly from Cambodia and Burma, are living in poor and very humble circumstances. They share with up to 20 people a small room where the family lives and sleep together. But they have the opportunity to earn more money than in their homeland. A narrow and very shaky wooden bridge separates the working class neighborhood, which located on the left side of the Cha-Am harbor from the actual port. The bridge is about 70 cm wide and has wood planks as floor. 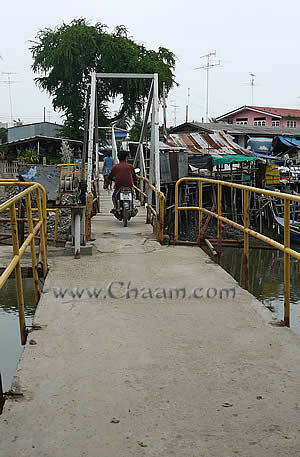 Here motorcycles roar across the bridge, though two oncoming people have very little space. But: It works and that even without an accident! 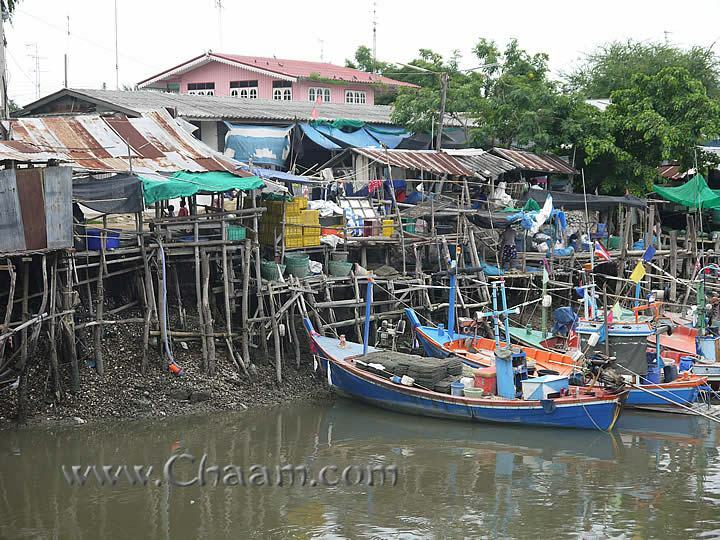 A small market opens up directly behind the port of Cha-Am. 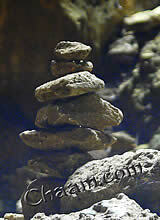 Here you can´t buy any interesting tourist souvenirs, only things for everyday life or fresh food. 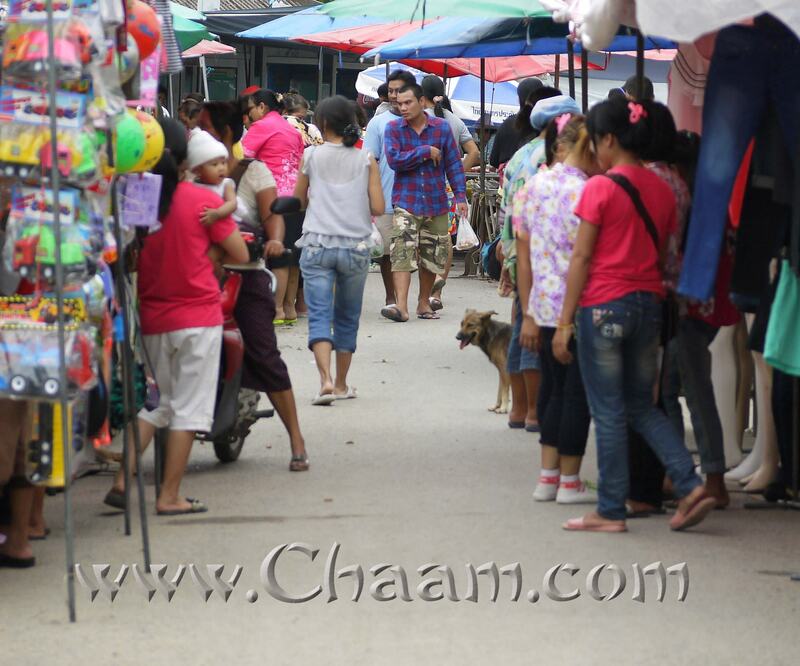 In contrast to the other markets in Cha-Am, this market is quite cheap, actually there are no tourists to find that drive up the price structure. 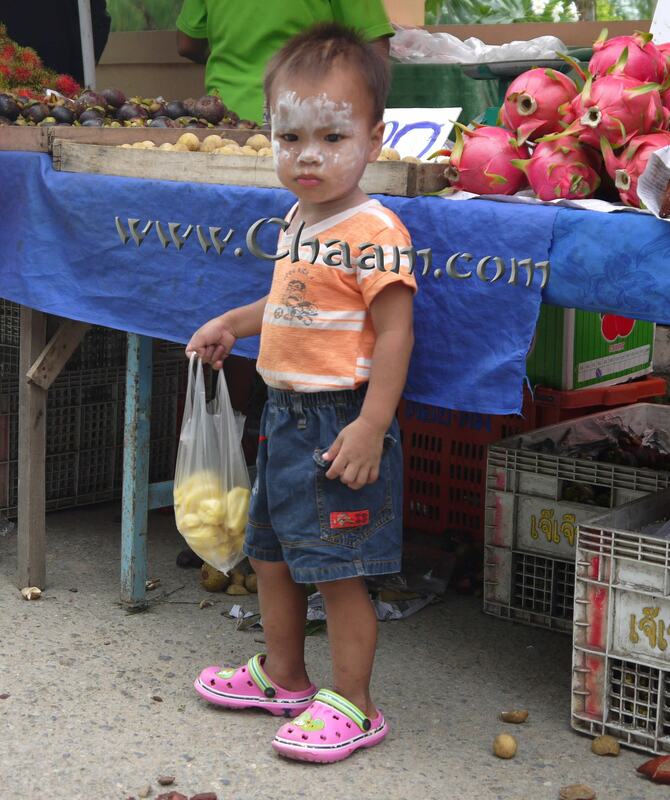 A small white powdered boy stands in front of a fruit stand at the market of Cha-Am in the fishing village. He proudly carries a bag of pineapple in his hand. He seems not to have seen often any farangs because he looks a little bit fearful and turns right around and runs back to his mom. 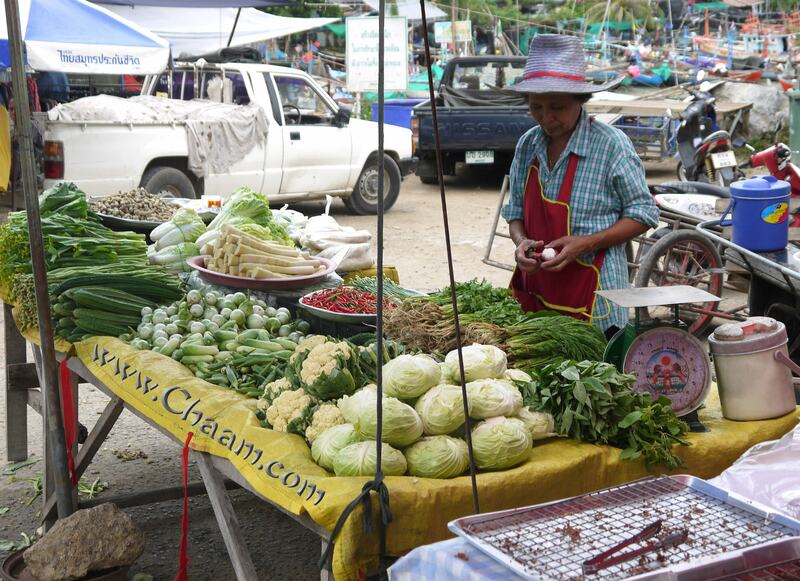 At this market stand are offered all the ingredients for a delicious Thai soup In addition to various cabbage and chili peppers are also some unknown herbs and leaves, which have healing effects and a detoxifying effect in the body.